How many people in Western Australia have dementia? There are 41,149 West Australians with dementia. Without a medical breakthrough, this number is projected to increase rapidly to 84,161 by 2036. Source: NATSEM calculations using ABS population projections. Please contact us if you would like more information on how to subscribe to our newsletters. Our Annual Reports outline the functions, services and activities of Alzheimer’s WA for each financial year. 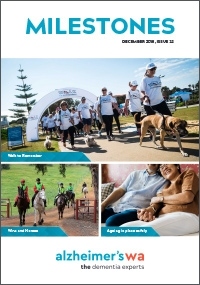 Read the latest issue of Milestones – the quarterly newsletter of Alzheimer’s WA. Read our Member Connect newsletter to find out the latest news, the difference we’re making, and most importantly, how you can help. Subscribe to our Dementia Aware newsletter to keep up to date with the latest dementia research and innovation, as well as details of our educational workshops and courses and upcoming events.